Crescent Dunes Solar Energy Project’s profits were sharply up from the last year of sluggish energy sales, according to the third quarter report that the parent of the plant, Tonopah Solar Energy, LLC has filed with the Federal Energy Regulatory Commission. David Jacobs/Pahrump Valley Times Tonopah Solar Energy LLC is a subsidiary of SolarReserve, a Santa Monica, Calif.-based privately held company that calls itself a leading global developer of utility-scale solar power projects, including electricity generation by solar thermal energy and photovoltaic panels. The plant generated $12,290,108 from July 1 through Sept. 30, according to the federal records. In comparison, for the first quarter of 2018 from Jan. 1 through March 31, the Crescent Dunes Solar Energy Project earned only $1,627,146 in sales. In the second quarter of 2018 from April 1 – June 30, it generated $7,948,173 in sales. Tonopah Solar Energy LLC is a subsidiary of SolarReserve, a Santa Monica, Calif.-based privately held company that calls itself a leading global developer of utility-scale solar power projects, including electricity generation by solar thermal energy and photovoltaic panels. Mary Grikas, SolarReserve vice president of global communications, declined to comment on Crescent Dunes’ third quarter sales report. “Electricity from Crescent Dunes is sold to NV Energy under a 25-year fixed price contract. SolarReserve doesn’t release any sales information outside of statutory requirements,” Grikas said in an email. Crescent Dunes Solar Energy Project’s earnings were previously down after a small leak in tank filled with molten salt has shut down a $1 billion solar plant outside of Tonopah. Prior to the shutdown, the plant generated $11,437,584.52, according to the FERC’s data for the third quarter of 2016. 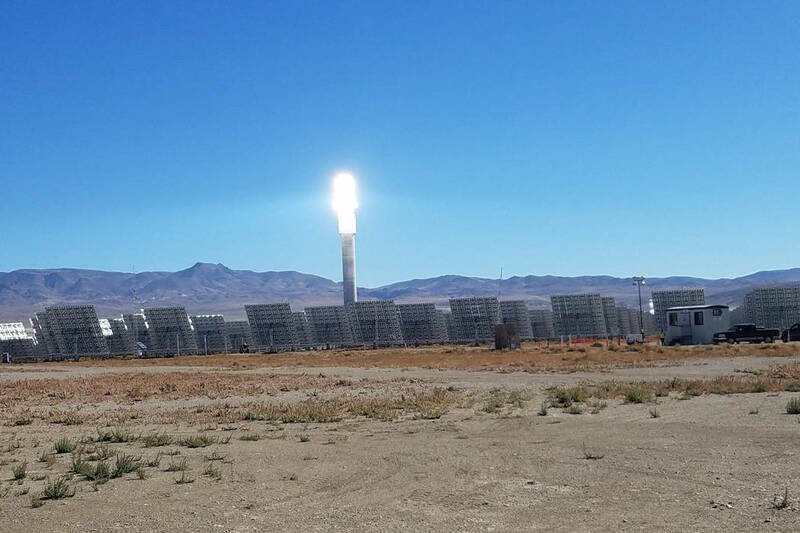 NV Energy, the sole customer of Crescent Dunes began receiving energy on July 12 for the first time since the facility was shut down for repairs and maintenance in late October 2016. The Crescent Dunes Solar Energy Project had no energy sales during the first and second quarters of 2017, according to previous federal reports. And in the months following it repair, quarterly sales have been significantly lower than prior to the leak. It generated $4,404,272.35 in energy sales during the third quarter of 2017 and $1,326,254.91 in the fourth quarter of 2017. The Electric Quarterly Report is the mechanism that the Federal Energy Regulatory Commission uses for public utilities to file their rates and charges on a quarterly basis. FERC is the U.S. Department of Energy arm that oversees the wholesale of the power and transmission of power plants across the nation. FERC’s Electric Quarterly Report provides data summarizing the contractual terms and conditions for all of its jurisdictional services. This includes cost-based sales, market-based rate sales and transmission service, as well as transactional information for short and long-term market-based power sales and cost-based power sales. The average price in megawatts per hour at Crescent Dunes from July 1 through Sept. 30 2018 was $137.78 with four lines operating. In comparison, previous quarterly reports showed only 2 or three lines operating. The fourth quarter runs from Oct. 1 through Dec. 31. The report filing deadline is Jan. 31.